In spring and early summer these attractive but very variable fungi emerge in woods and beside hedgerows, often carpeting paths and flowerbeds that have been spread with wood chippings. This early-fruiting mushroom is an uncommon but far from rare find in Britain and Ireland. Spring Fieldcaps occur throughout Europe and are found also in North Africa and parts of North America. Commonly known as the Spring Fieldcap or, in some older field guides, as the Spring Agaric, Agrocybe praecox is one of a complex group of fungi that are very difficult to separate in the field. 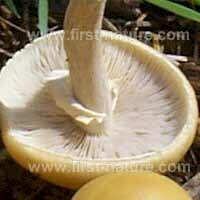 Note: In some field guides this mushroom is recorded in the family Bolbitiaceae. The currently accepted scientific name Agrocybe praecox dates from 1889, when Swiss mycologist Victor Fayod (1860 - 1900) transferred it to the new genus Agrocybe that he established with Agrocybe praecox as the type species. Synonyms of Agrocybe praecox include Agaricus praecox Pers., Agaricus togularis Pers., Agaricus gibberosus Fr., Pholiota praecox (Pers.) P. Kumm., Pholiota togularis sensu Gillet, Agrocybe gibberosa (Fr.) Fayod, and Togaria praecox (Pers.) W.G. Sm. 'Fieldcap' is derived from Agro-, of fields, and -cybe, head or cap, and is therefore a direct translation of the generic name Agrocybe. The specific epithet praecox is a Latin word meaning 'developing or appearing early'; it has the same origin as the adjective 'precocious'. 3 to 9cm in diameter. Cream or pale tan; convex and slightly greasy when young, expanding to almost flat with a smooth surface that sometimes wrinkles and crazes when old. The cap flesh is firm and almost white. Adnate or adnexed to almost free, the gills are pale buff at first becoming dirty brown as the spores mature. Almost white when young, becoming browner with age, the stem has a white ring that discolours to brown as the spores mature and fall. 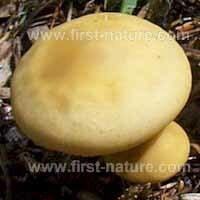 The stem is 5 to 15mm in diameter and 4 to 7cm tall; its base is slightly swollen. 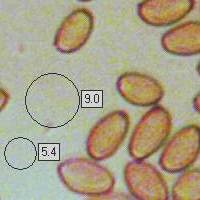 Internally, the fibrous stem is solid and has buff flesh that ages light brown. 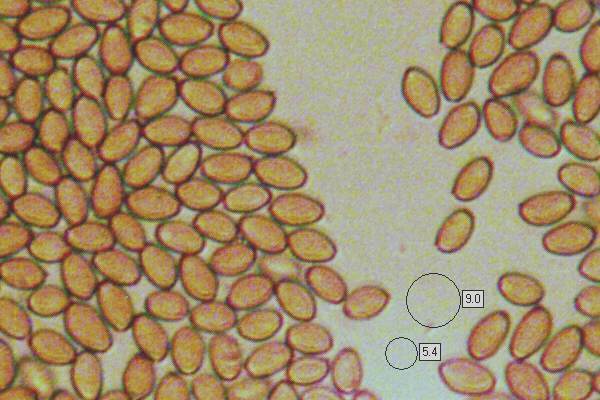 Ellipsoidal to ovoid, smooth, 7.5-10 x 5-6μm, with a prominent germ pore. Slightly mealy odour; nutty but rather bitter taste. Scattered or in small tufts at woodland edges, and beside wood chip paths and on rotting straw. May to August; occasionally in September. Agrocybe molesta (synonym Agrocybe dura), which also occurs in spring, is paler and has an umbonate cap that usually cracks when fully expanded. 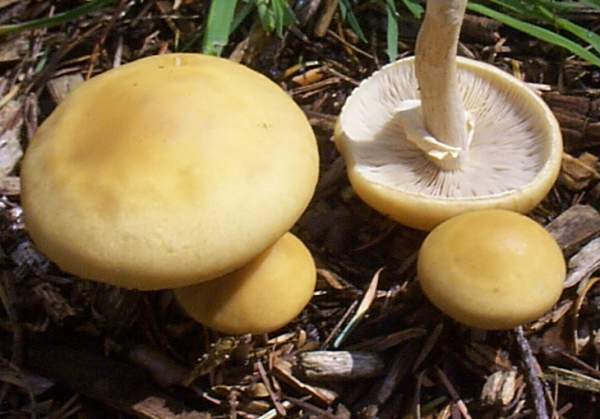 Agrocybe cylindracea grows on stumps of poplars and willows. 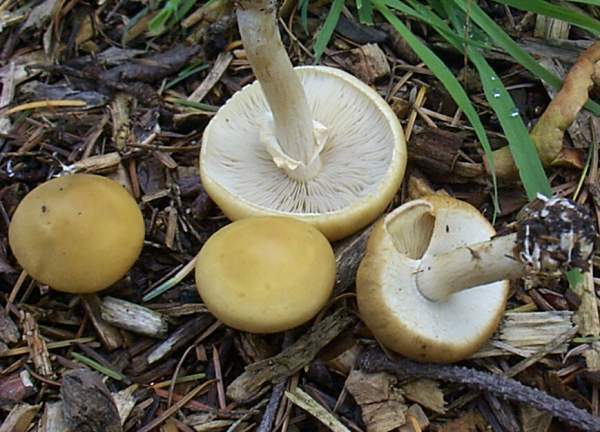 Agrocybe praecox is considered edible if well cooked, but it is said by some to retain a bitter taste and is of very poor quality. 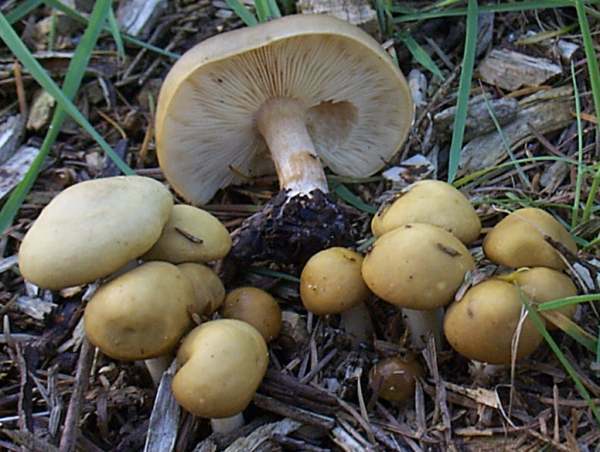 Most field guides say that this group of fieldcap fungi is best avoided when gathering mushrooms to eat as they are easily confused with a number of seriously toxic toadstools. Marcel Bon, 1980: Revision du Genre Agrocybe Fayod. Bulletin trimestriel de la Fédération Mycologique Dauphiné-Savoie, 76: 32-36. Bulletin de la Fédération trimestriel Mycologique Dauphiné-Savoie, 76: 32-36. Henning Knudsen & Jan Vesterhout (2008). Funga Nordica. Copenhagen: Nordsvamp. p. 828.